It is literally freezing here in Atlanta today. A cold 6 degrees to be exact. I don't fair well in this kind of weather. We went to drip the pipes last night only to find the half bath has already frozen. I'm praying that the pipe won't burst. That's the last thing we need right now. The guest bath is continuing to transform before my very eyes. Be sure to check out our original post on the Ugliest Bathroom in America, as well as the others HERE and HERE. A few weeks back we found these beautiful tiles ON CLEARANCE at our local Floor & Decor store. Y'all, I literally screamed when we saw them... giant subway tile? YES! 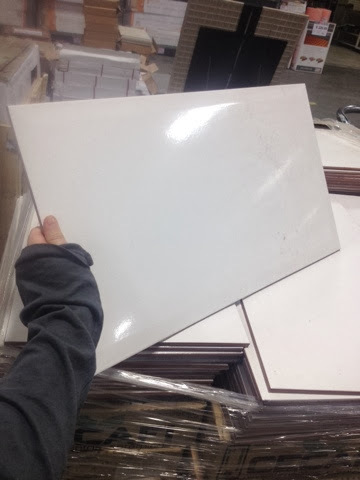 Due to the clearance price, we only paid $80.00 for the tile. SCORE! 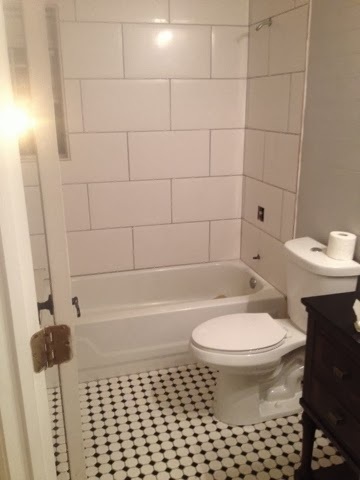 We opted to go with the same Dalorean Gray grout we used on the floor. Hubs rented a tile saw from Home Depot and we went to work. 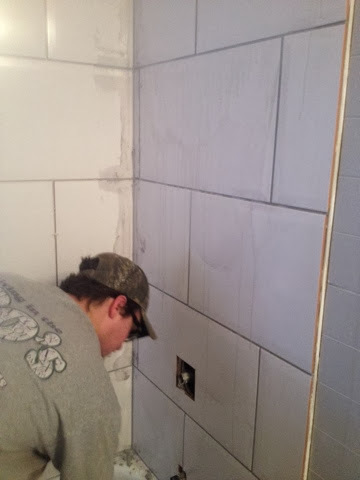 Due to the tiles being so large, the job went fairly quickly. 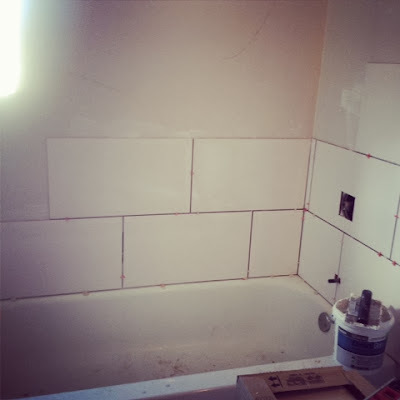 Grouting is messy work! Hubs used his grinder to cut out holes for the plumbing. So happy I married a handy guy. I guess I forgot to mention, we got a new toilet too. It was on sale for $100.00 at Home Depot. It's a dual flush. Cause, we are fancy like that. 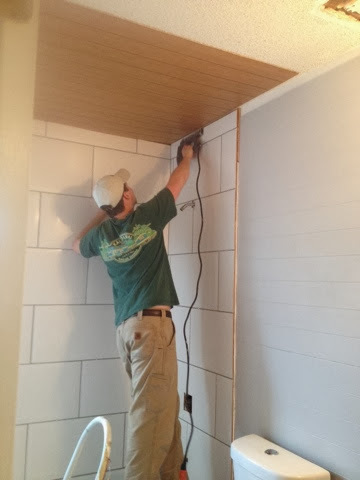 Once the shower tile was finished, we added paneling to the ceiling as well. We used the same panels we previously used on the walls. We attached them to the ceiling using adhesive and nails. 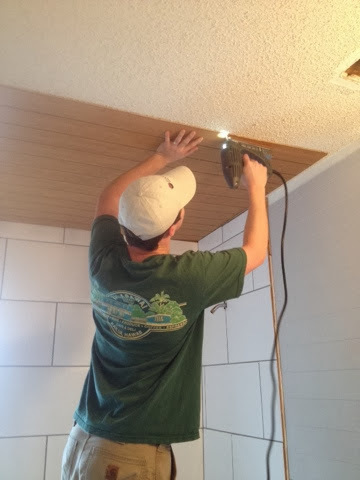 Once the ceiling was in place, he added extra trim and crown molding along with walls. We painted it all white to pop against the paneling on the walls. 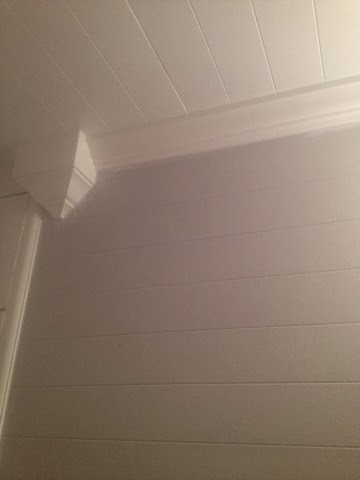 Everything was caulked and then caulked again. 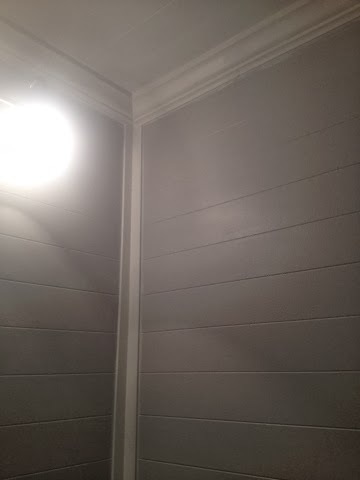 All wood used is treated to stand up to moisture. I can't tell you how happy I am with the way the paneling came out. It totally achieves the planked, farmhouse look I was going for. We also added a new shower faucet and head kit. The brushed nickel looks more updated than the crap that was there before. As you can tell, things are progressing quickly over at the Goodwood Reno! 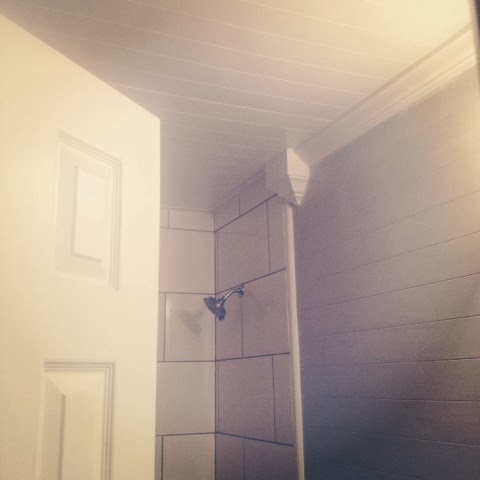 The Ugliest Bathroom In America transformation is almost complete! I'll be sharing the final touches on this project later this week. Stay warm, friends! Talk soon! I love what you have done !!! What makes it even better, you did the work yourself. So proud of both of you !!! 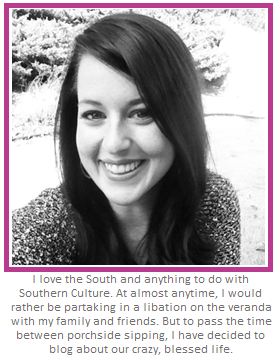 Brandi- thanks for the inspiration. We have the second ugliest bathroom in America. Am so wanting a change but home improvement is not our thing. Will keep following for ideas. Carpet in a bathroom- wtf? I love what y'all have done.